Please join us this Remembrance Day to give thanks to our Veterans and those who gave their lives for Canada. Thursday, November 24th - KYC 121st AGM (start time is 7:00PM). We are having our annual dinner buffet ($15.95) from 5:30 - 6:30 - Please sign up as so we know you are coming by emailing manager@kingstonyachtclub.ca. Please come down and try out our fantastic new selections on our new Winter Menu. Please let us know your thoughts and your favourite dish! As the season comes to an end, kindly make sure all ladders are locked up appropriately and your boats are secure for winter storage. All Storage Locker owners, please check your lockers at your convenience to confirm no water is leaking within the locker during the winter and all electrical appliances are unplugged. Your co-operation is much appreciated to ensure the lockers remain in good condition. On November 7th, 2016 Canada, represented by Queen’s University, became the second North American team to win the Student Yachting World Cup in its thirty-six year history. 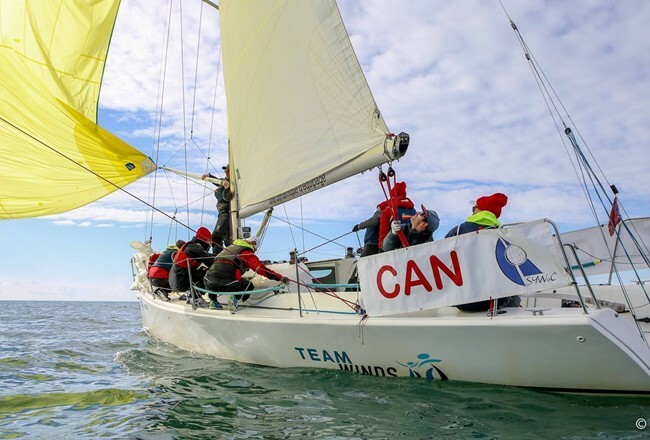 The Canadian team started slowly having to figure out the new boats but with careful and deliberate debriefs, attacked their weaknesses as they attacked the competition, and moved steadily up the leader board. After posting a 3-1-1-2 on the penultimate day, Canada sat in first place by 3 points. The final two races would be a last fleet race, and a medal race that could not be dropped. The first race of the final day Queen’s managed to extend their lead to 4 points, but after missing the first shift during the medal race the team looked in dire position. I think it’s safe to say that it would have crossed the whole team’s minds that we had missed our chance for gold – but nobody gave up. The team pushed hard, passing boat after boat to finish in fourth place and win the regatta by one point. For hours we could barely believe it. We checked results over and over, we checked for protests although we knew there were none, and as these things do, it took some time to set in. The Irish won the night race trophy, England 2 (Southampton) won the coastal trophy, and the overall trophy, top spot on the podium, national anthem, and champagne went to Canada. The California Maritime Academy deserve a very honourable mention for sailing so well and being such fierce competition to the end, finishing second by a single point. The team could not have done it without the work and support that came well before the event: Support from Lunenburg Yacht Club, the Kingston Yacht Club, and their respective members. Thanks also to the Thompson family who held a fundraiser in their own home, as well as the many local business in the Kingston, Lunenburg, and Oakville areas for donating to our fundraisers. Thanks to Hugh McGughan who gave us nearly free reign of Breakaway J, and Michael Hull who had us out on Ritalin both to race alone and with his coaching. Finally thanks to the endless support from friends and family leading up to and during the event, one word of encouragement is never insignificant. Once again, our annual KYC Awards Night was a great success! Congratulations to all the winners. We had a turnout exceeding 100 people. Thanks to everyone who helped make this night a memorable one. As usual, the food & service were top notch, thanks to Greg, Chef Neil and the staff. A major highlight of the evening was the co-winning of the KYC Achievement and Leadership Award by Melodie Gummer (Canadian Women's Keelboat Champion) and Danielle Boyd (2016 Rio Olympics), for their outstanding achievements in racing outside KYC. Danni thanked KYC for its support and presented Vice Commodore Ross Cameron with a framed jersey from Rio.